Noctor shared insights into the online world's affect on child development that provoked a lively discussion after his lecture. Webster Geneva filled the house for a guest lecture, "Sexualisation in an Online World," by Colman Noctor, a child and adolescent psychoanalytical psychotherapist. 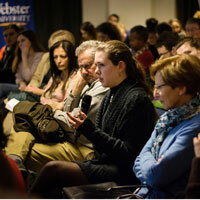 The talk explored the impact of increased access to sexualised material for children and young people who are now spending increased amounts of their time online, alongside the challenge of regulating online material and the possible impact of the online evolution on the sexual development of society's digital natives. "It's no small feat to have a 90 strong audience on the edge of their chairs for an hour long lecture, laughing every few sentences whilst simultaneously re-evaluating everything they knew about one of the most used technologies in the world," said Jessica Wright, a student who attended the event. Noctor's visit was organized by Webster Geneva's Psychology and Counseling Department as part of its Annual Lecture Series. Read more and see photos from the event in this Webster Geneva post.